. . . sketching while my husband underwent yet another medical procedure for back pain. Not sure it actually did any good yet, but hoping for improvement. Sketching does help fill the waiting time. 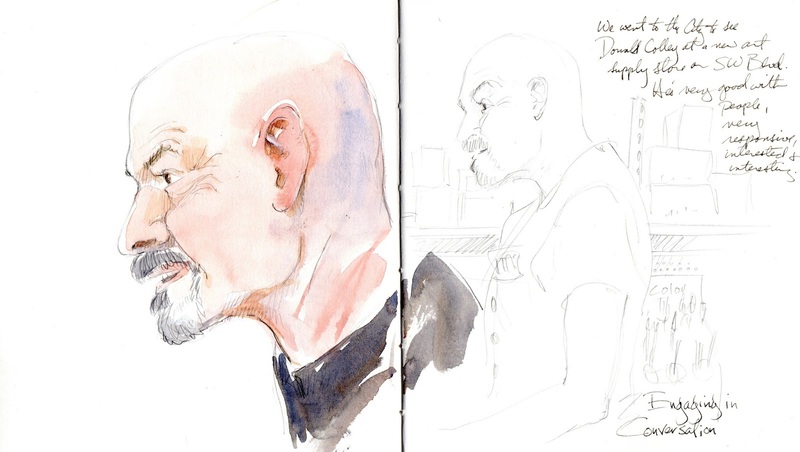 Don was in Kansas City yesterday to demonstrate his use of Faber-Castell drawing tools at Artist & Craftsman Supply on SW Boulevard, and J. and I were delighted to get the chance to meet and talk to him. 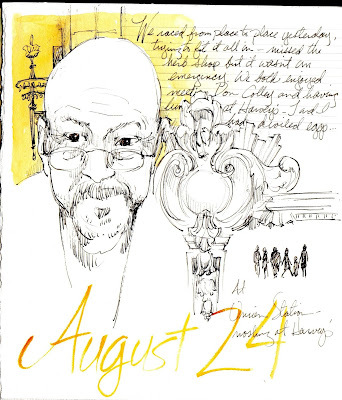 I was enthralled paging through his inspiring journals and loved listening to him talk to his interested audience (he is a LOT more relaxed in public than I am! ), sketched him at work and shot a few photos. Then we all went to grab a bite at Harvey's, in Union Station. Don ate, I sketched the above, and we talked of cabbages and kings...lots of fun! At Artist & Craftsman Supply in Kansas City. This couple stayed for a long time, asking questions and talking...they were interesting too! Heyyy...I've sketched this same old theatre in Kansas City...Don didn't get a chance to finish but I recognized it in a flash. Standing at the center of Tower Grove Park in a roundabout is a monumental bronze statue of William Shakespeare by the Bavarian sculptor Ferdinand von Miller. The work, a gift of Mrs. Henry Shaw, was dedicated in 1878. 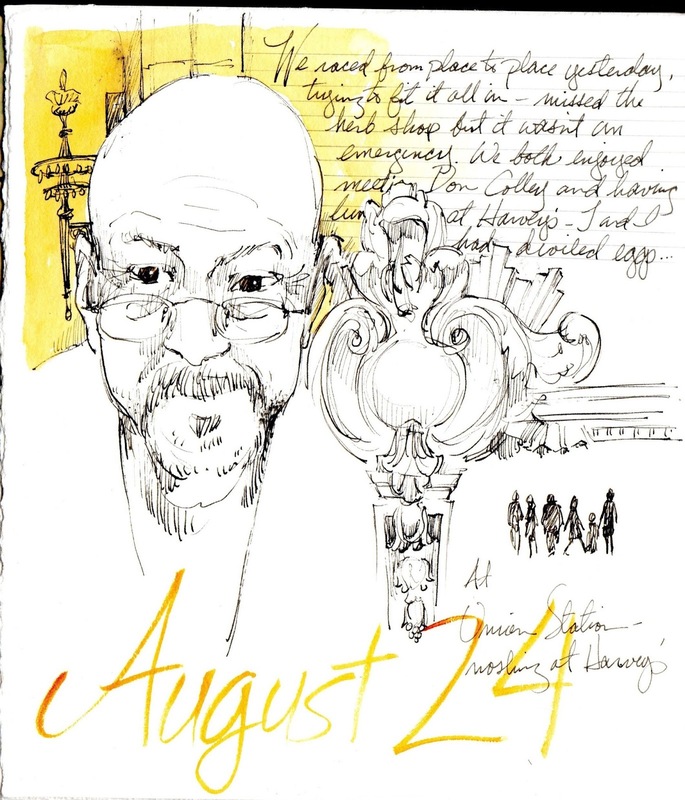 I began my sketch early in the day which was good because by late morning the park was beginning to fill up and someone parked their car right in front of me effectively blocking my view. Fortunately I was close to finish plus I had taken a reference snapshot earlier. I put the final touches on this one in my studio. 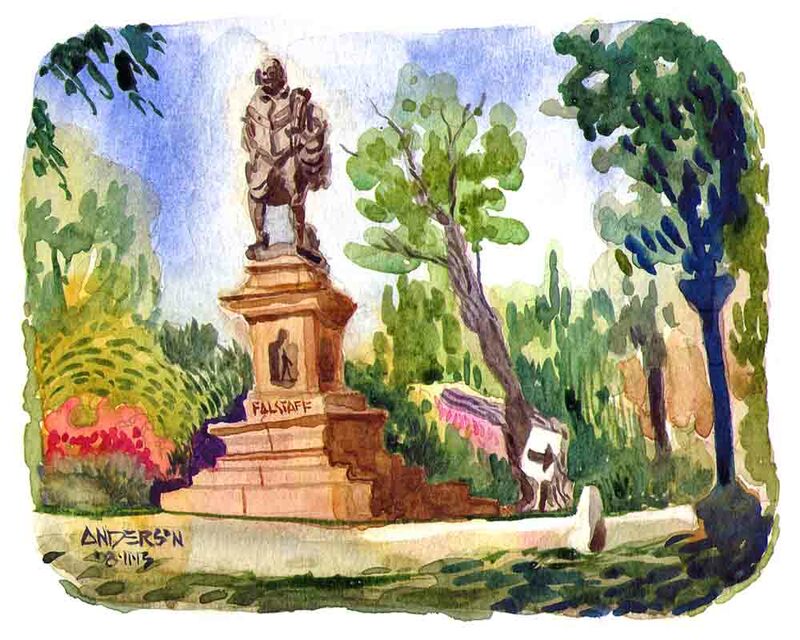 Shakespeare Statue, Tower Grove Park, St. Louis, 08/11/13, Michael Anderson, watercolor on canson 140lb cold press, waterbrush. 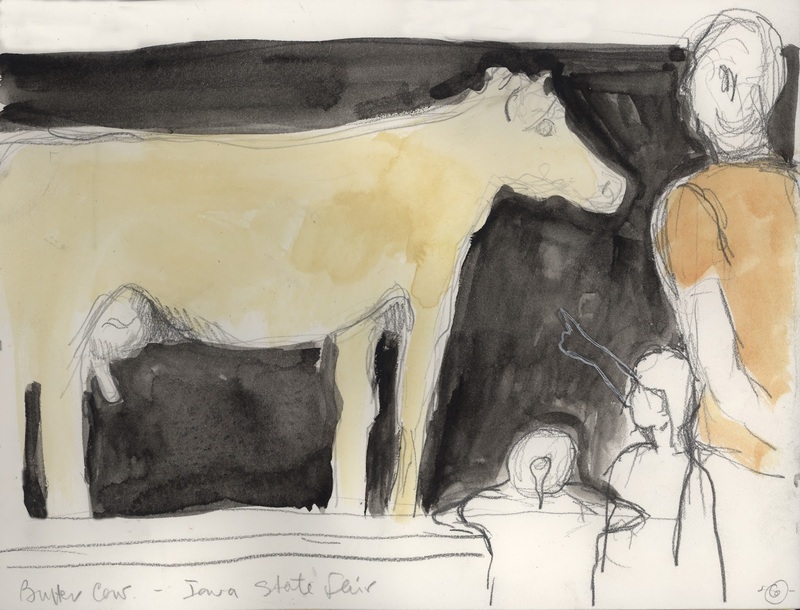 The Iowa State Fair is one of the largest in the country. Held for 11 days in August, it's been an annual tradition almost every year since 1854, highlighting the best and biggest of all-things-Iowa. On the spur of the moment, my husband and I drove the two hours to the Fairgrounds in Des Moines. The weather was perfect. 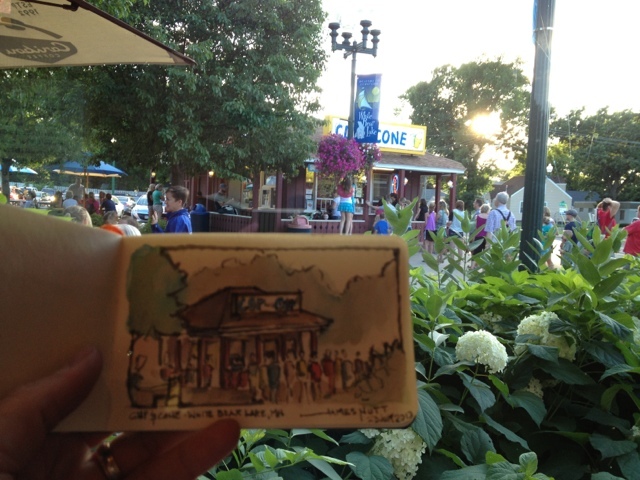 We hadn't been in years--not since our kids were little and before I carried a sketchbook for on-site drawing. At the Family Food Center, the results of the canning competitions were beautifully displayed in glass cases. We used to do canning. And now, in the summer, homemade refrigerator pickles are a staple. 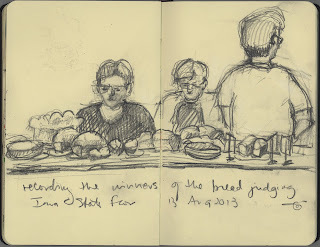 Around the periphery of the Family Food Center, the serious work of judging edible entries played out. 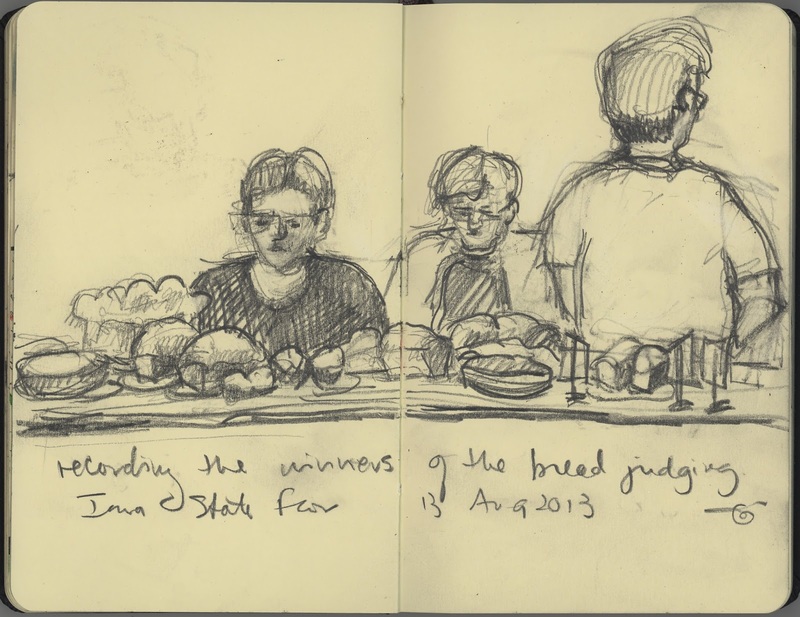 Here, the judging for the Breads, Muffins and Rolls category has been completed and the results are recorded before the winners are placed with their ribbons behind glass. The judging of Beans was on-going (6 judges tasting with a rapt and silent audience watching, videographers recording every mouthful). Salsas were being assessed in the far corner. Quiches were among the ones scheduled for the following day. At the Agricultural Building, a cow is sculpted from butter (600 pounds!!) every year since 1911. Young and old file past the windowed cooler. The lines were particularly long because two days before the beloved butter cow had been vandalized!! PETA, the animal welfare group, had broken into the cooler on Sunday night after closing and poured red paint over the butter cow and scrawled "Freedom for All" on the window. By Monday morning's 7AM opening, the sculptor had scraped the red paint from her creation and all hints of dissent had been removed. While on the subject of cows, over at the Cattle Barn, these young farmers were primping their steer for its upcoming competition. 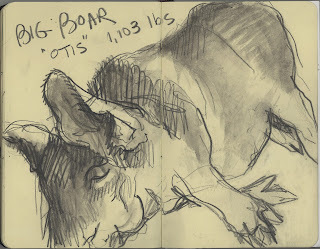 In the adjoining Swine Barn, there were hogs galore, but none more captivating than Otis, who was fast asleep with his snout in his food bowl. Proclaimed the biggest boar of the 2013 Iowa State Fair, weighing in at 1,103 pounds, Otis was measly compared to last year's all-time Big Boar named Reggie, who weighed in at 1,335 pounds. 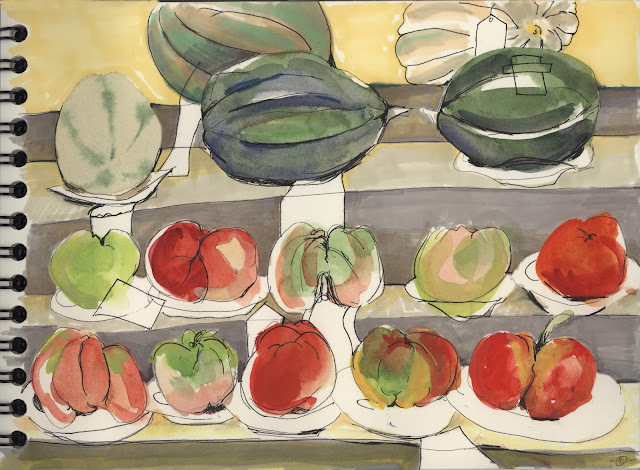 Returning to the Agriculture Building, tomatoes and melons in the Jumbo Vegetables category are displayed on styrofoam plates with their ribbons. One day at the Fair is not enough. Next year we'll plan ahead and book a hotel room so we can be at the Fair two days in a row. I definitely saw more drawings to do than 8 hours allowed. 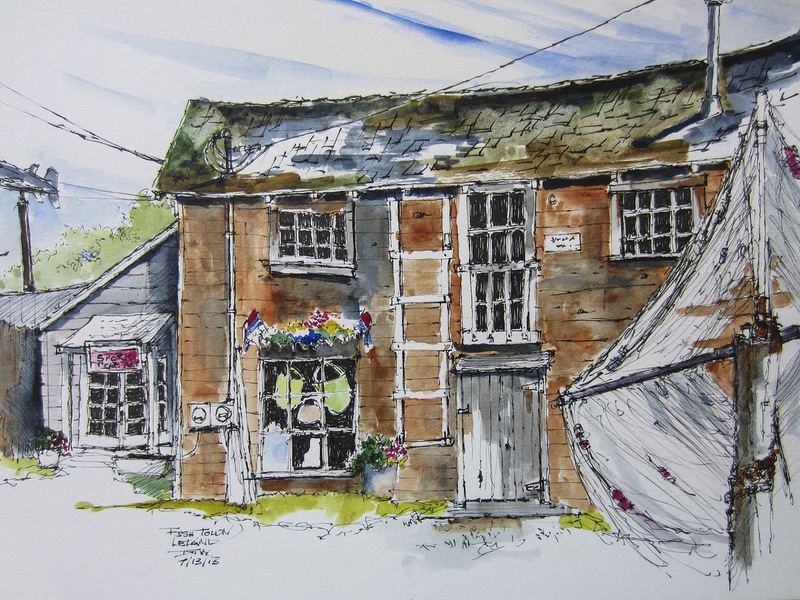 Visit my Flickr site to see all my Fair sketches and more specifics about them. It's been awhile since I've posted, not because I haven't been sketching but because I haven't been scanning. This sketch is from the backlog. It's from the recent Monday sketch outing. 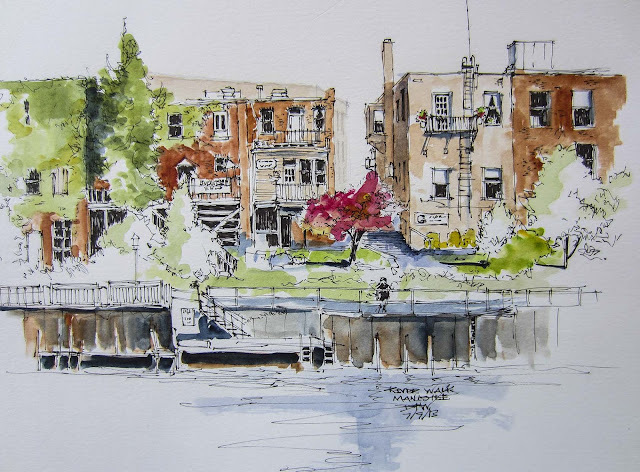 Seven of us met at the south end of Belmont Harbor. We had a good discussion about painting clouds and greens as well as quiet time to paint. The winds were at our backs - good fortune - the rain held off until we were packed up and leaving! I'm still loving the S&B Beta series for watercolor sketching. It's always good to know the way UP and OUT. On Saturday, we took our granddaughter Mikala, visiting from Texas, exploring the underground of Hutchinson, Kansas. One of the world's largest salt deposits was discovered there in 1887 (though I'm sure that Native Americans knew of it much earlier), spanning across Kansas, Oklahoma, the pan-handle of Texas, and into New Mexico. Still actively mined today, they also have a museum and visitors' center in one of the older sections of the mine. Mikala looked cute in her hard hat. Lots of hands-on exhibits showed how the salt deposits formed (when an ancient ocean covered this land), the variety of salt found here, and unusual formations such as fluid inclusions (pockets of ancient sea water trapped inside particularly pure specimens). Hard hats were required to be worn by all, as well as our being issued emergency breathing apparatus in case of fire . . . . even though salt can not burn. Lots of discarded mining equipment was scattered about --- workers were told "what goes in the mine, stays in the mine", the company owners not wanting to tie up man-hours and equipment for hauling it out. Piles of lunch wrappers and other rubbish from previous generations of miners are now museum artifacts. At the end of the "dark ride" through the tunnels, we were able to choose some bits of salt as souvenirs. Mikala found the prettiest red salt sample, as well as a pure bit with a fluid inclusion inside -- we didn't discover the water bubble until later at home, holding it up to the light. I found this old girl when I was out looking for something to sketch Saturday afternoon. 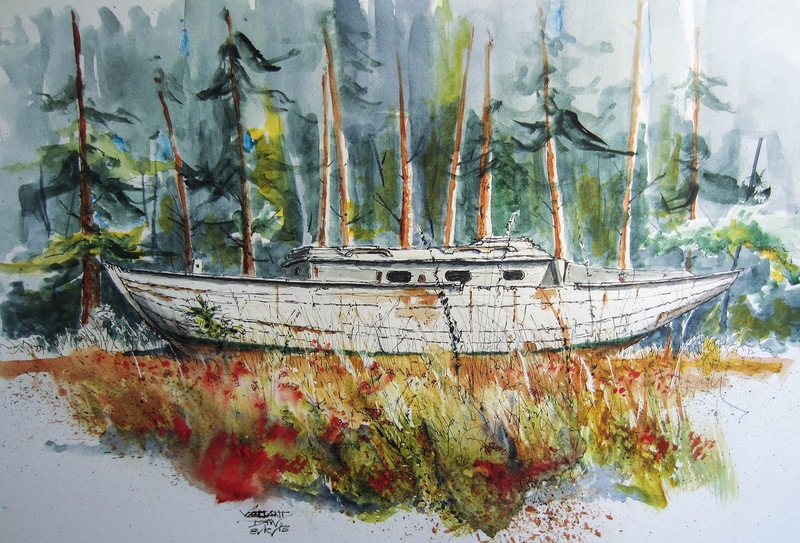 The once beautiful sail boat is sitting in the weeds in the back of a field that was home to a wood boat restoration business in Montague Michigan. The restoration business is gone, in it's place is a garage that fixes car mufflers and brakes. The field that once cradled wood boats waiting for repair now hosts cars in various states of repair and decay. When I finished working on the sketch I waded through the weeds to the back end of the boat to discover the old boat still carries the name "Valiant" on her stern. This is one of the cast of old buildings that populate the water front area in Leland, Michigan. 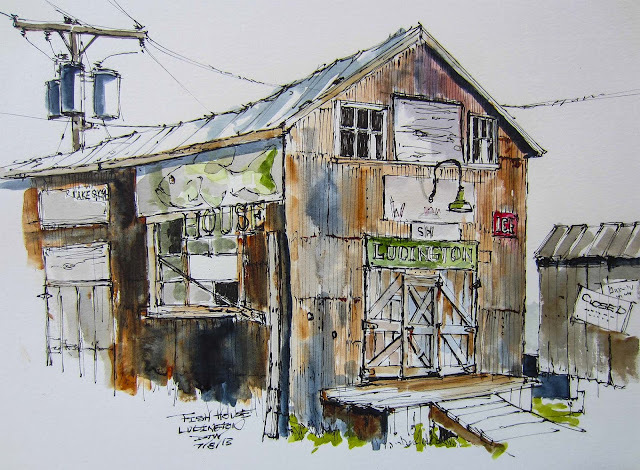 The building is part of Leland's "Fish Town" that demonstrates what the the fishing industry on Lake Michigan looked like many many years ago. Unfortunately these days "Fish Town" has more to do with selling t-shirts and souvenirs than it does recreating Michigan History. This piece was done during our trip north on our boat while the boat and we were docked next door at the Leland marina. I'm working on drawing quicker than I used to. Trying not to belabor details too much and focusing more on the overall character of a place has been my goal. I liked this corner with the umbrellas and activity around the space. Also attempting to add people which has been a fear for me in the past. I'm pretty happy with the results I have here. 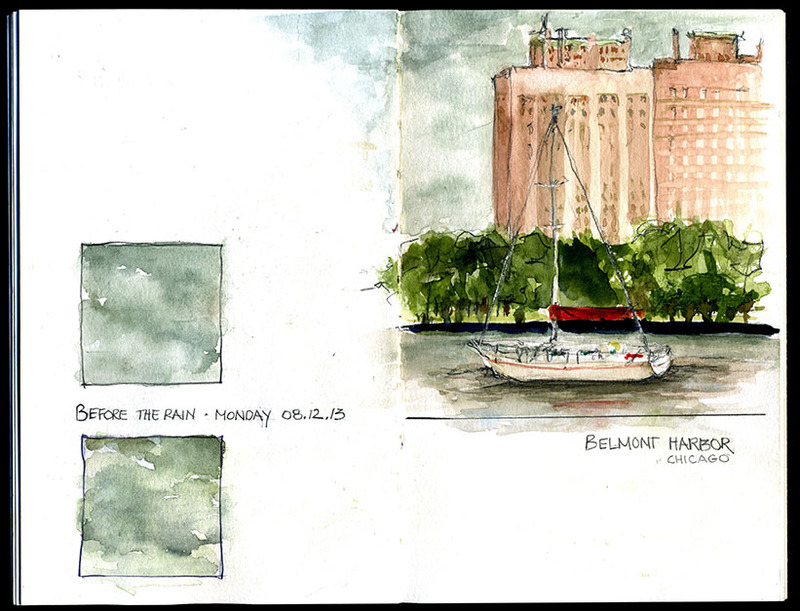 Stillman & Birn Beta Series sketchbook. Yesterday Bill had a repeat procedure to ease severe back pain. Both the doctor and the nurses agree that this will only provide short-term relief (a bit over one month). Unfortunately, our insurance company will not pay for the correct procedure (that will provide long-term relief) until he has undergone this particular injection twice. Stupid insurance companies. 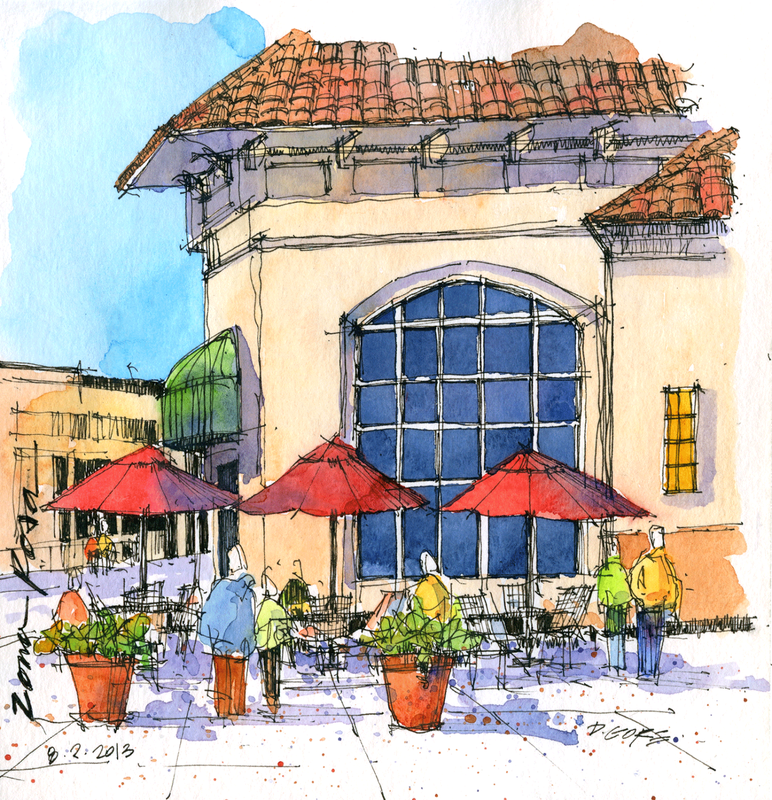 The newly built hospital is all curves, chrome, and glass -- I wanted to catch the sunlight's patterns in this sketch. The level of care here is top quality -- he was treated very well by all. I've been trying to spend part of my lunch hour drawing. 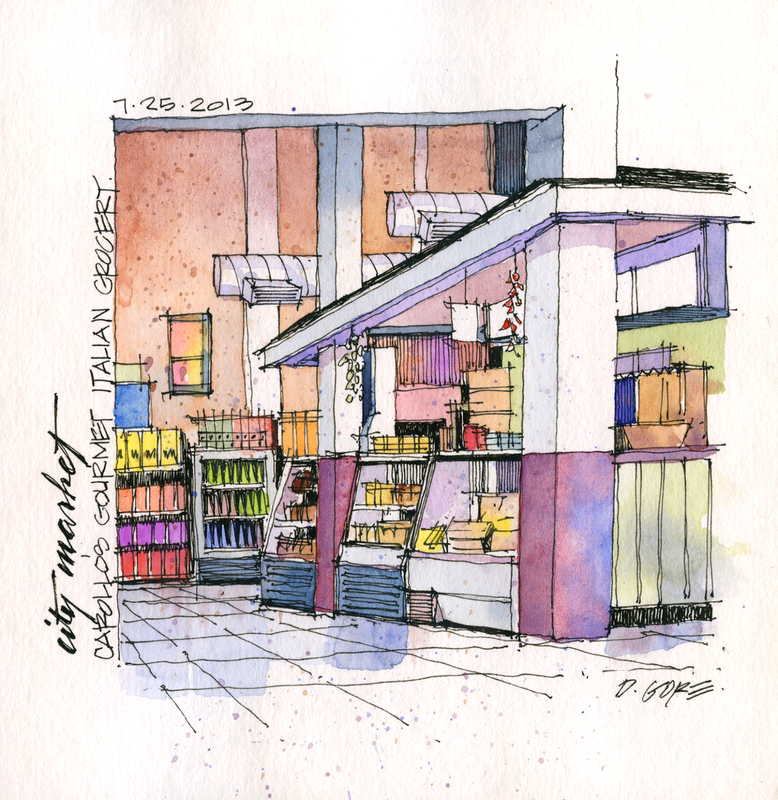 This particular sketch is of a small Italian grocery in the City Market in Kansas City. They have great sandwiches and it is a very interesting little market. From the table where I was eating, I could see this counter so between bites, this is what I drew. I did the drawing only from my seat and added the color later at home. 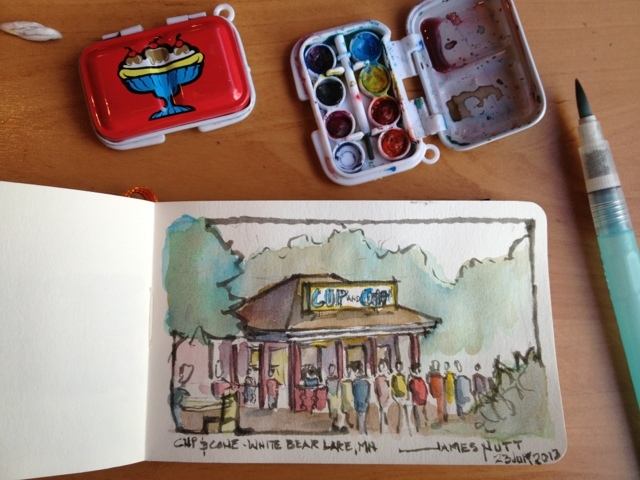 This too was a lunch hour sketch and again in small deli not too far from the City Market. 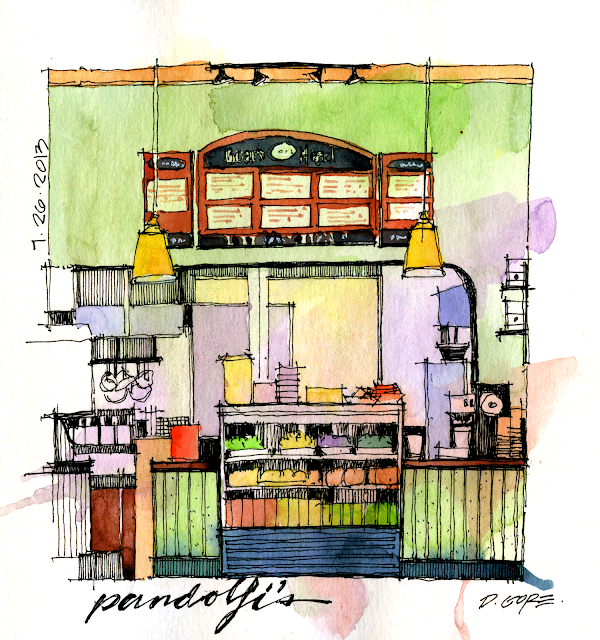 They have great sandwiches as well and the counter area is very appealing. The kitchen area is back behind the counter and the smells in the place are great. 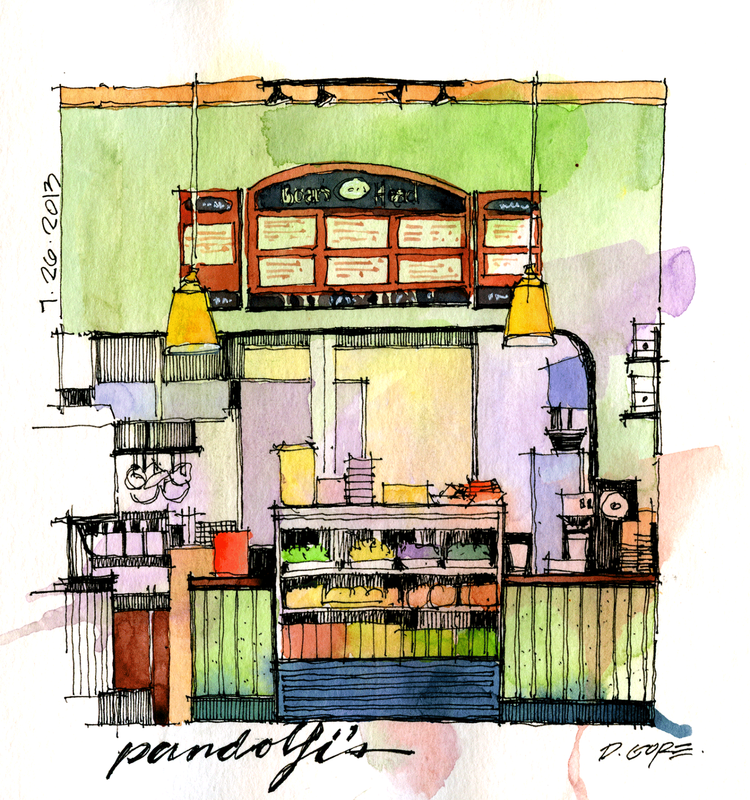 They have a wonderful Chicken Mufaletta that is very tasty. 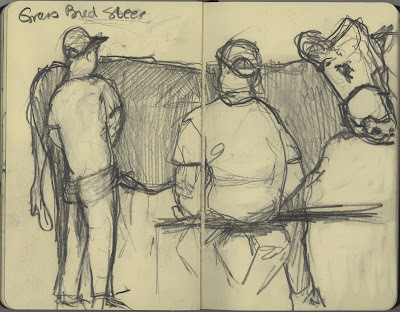 These were the first two sketches in a new Stillman & Birn Beta Series sketchbook. I am really liking the texture of the paper and my fountain pen with extra fine nib work very well in this book. The watercolor washes go down well and don't create much buckling of the paper. Great book!